Not quite correct. Soviets made plastic ICs just as much as western companies did. 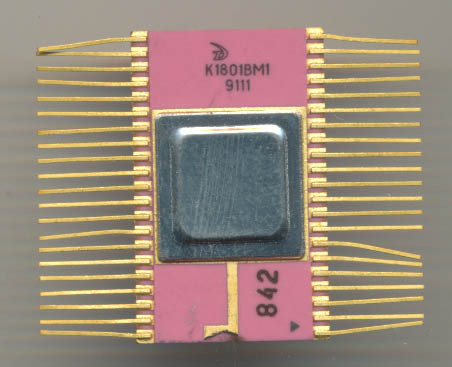 You can find pictures of KR580IK80A in plastic packages made in 1983. Also most of K155/K176 logic (74xx and CD4xxx) were made in plastic packages since ’70s. Military (and some industrial) ICs is a bit different story, and they almost always use ceramic packages. It is the same both for Soviet and western components. Also regarding reliability – back in 1990 I worked for a small company were we “repaired” a bunch of new ES1841 computers, and they mostly had mechanical problems – unreliable connectors, damage due to transportation to HDDs. I don’t remember a single case of a bad CPU or some another ASIC. Soviet chips were unreliable, but the milspec ones were very throughly tested. Some plastic ones could fail after a few hundreds or thousands hours. ROMs, RAM, i8255 clones could be very unreliable. Yields were low, costs were high, technology lag very significant. While there are some cool military designs produced in tiny numbers with huge effort, vast majority of mass-produced chips were direct clones of the western ones, but less reliable, more costly to produce and already outdated.